The ashes of former Prime Minister Atal Bihari Vajpayee, which arrived in Guwahati from New Delhi on Wednesday, were immersed in river Brahmaputra in the city on Thursday. The immersion was led by Assam Chief Minister Sarbananda Sonowal in presence of State Bharatiya Janata Party president Ranjeet Kumar Dass and BJP’s national general secretary (organisation) in charge of the Northeast Ajay Jamwal. 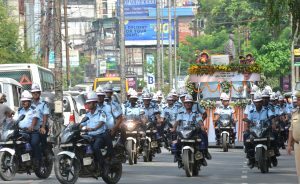 Earlier, the urn of ashes, which was kept in the State BJP headquarters at Hengrabari here, since Wednesday, was taken in a decorated vehicle escorted by Assam Police including City traffic police personnel and NCC cadets to Latashil playground. 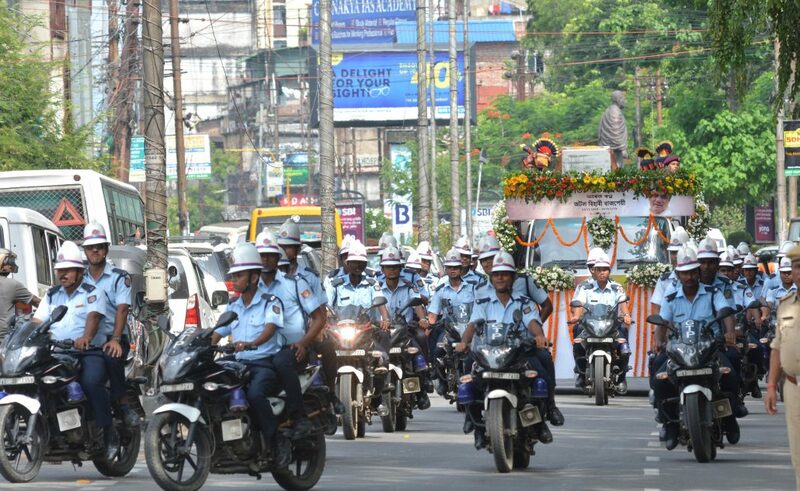 The former PM Atal Bihari Vajpayee’s ‘Asthi Kalash Yatra (procession of the urn of ashes), started from the State BJP headquarters at 1:30 pm on Thursday, was led by Assam Chief Minister Sonowal and State BJP chief Dass. The urn was received by Chief Minister at Latashil playground at 2:30 pm from where the urn of former PM Vajpayee’s ashes was taken to Lachit Park in Bharalumukh. The procession started again from Latashil playground at 2:45 and this time Chief Minister Sonowal, State president Dass, BJP’s national general secretary (organisation) in charge of the Northeast Ajay Jamwal along with other senior BJP leaders joined it on foot. The urn of ashes along with the CM and other BJP leaders reached Lachit Park at around 3:10 pm and an all-religion prayer meet was held at the park. 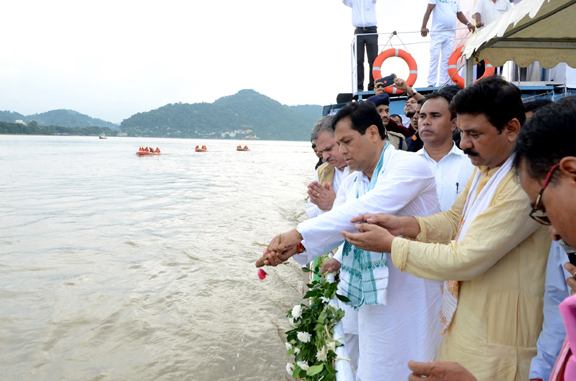 Then the urn of ashes was taken in a decorated vessel boarded by Sonowal, Dass, Jamwal and other BJP leaders from Lachit Ghat to the middle of the river Brahmaputra along with two other vessels boarded by media persons, one with VIPs and all the four vessels were surrounded by SDRF personnel in small boats. The ashes of former Prime Minister Vajpayee were finally immersed by the State Chief Minister in river Brahmaputra at 3:20 pm. Industries and Commerce Minister Chandra Mohan Patowary, Education Minister Siddhartha Bhattacharya, MoS for Health and Family Welfare Pijush Hazarika, MPs, MLAs, Chief Minister’s Media and Legal Advisors as well as chairmen and deputy chairmen of various boards and corporations were also present during the immersion programme.